Sunday – April 14 – Classic Country & Bluegrass Jam – 1:30 - ?? Motion Now to pay bills as submitted - $ 27,137.08. Second Pontsler, Heitkamp called for the question. Now = y, Pontsler = y, Heitkamp = y, Gehle = y, Young – y. Passed 5 yes. The committee has decided to kick start this year with a proposal to all - The lots will be discounted by 20% if you purchase AND build in 2019. There is also incentive for 50% tax abatement – would need to see Jeff for details. Other incentive is waiving the water / sewer tap in fees. We are making every effort to get the subdivision going. We are shovel ready! Come be a part of a great community!! Subdivision covenants are available at the village office and from Tammy Cheek at Homes at Ohio’s Edge Realty – Rockford. Tuesday, February 5, 2019, at 7:30 pm at the Rockford Village Hall. Also attending: Tom Stankard – Daily Standard, Srgt. Stetler, Judy Koesters and Robby Peel. Motion Gehle. Second Pontsler to accept the agenda as orders. Fox called for the question. Gehle = y, Pontsler = y , Fox = y, Young = y, Now = y, Heitkamp = y. Passed 6 yes. Janaury 15, 2019 council meeting as presented. Gehle called for the question. Fox = y, Now = y, Gehle = y, Young = y, Pontsler = y, Heitkamp = y. Passed 6 yes. Motion Fox to pay bills as submitted - $ 305,472.08. Second Young. Heitkamp called for the question. Fox = y, Young = y, Heitkamp = y, Gehle = y, Pontsler = y, Now = Yes. Motion Now to approve the monthly financial reports – * note additional report. Second Pontsler. Young called for the question. Now = y, Pontsler = y, Young = y , Gehle = y, Fox = y, Heitkamp = y. Passed 6 yes. Motion Young to approve supplemental appropriations to date. Second Gehle. Heitkamp called for the question. Young = y, Gehle = y, Heitkamp = y, Fox =y, Pontsler = y, Now = y. Passed 6 yes. Motion Gehle to approve additional 2019 purchase orders. Second Pontsler. Now called for the question. Gehle = y, Pontsler = y, Now = y, Young = y, Fox = y, Heitkamp = y. Passed 6 yes. Already finding it would be easier (like Tree City) to have a special revenue fund established for the radio station. Motion Now to create Fund 2905 – Radio Communications. Second Heitkamp. Young called for the question. Now = y, Heitkamp = y, Young = y, Gehle = y, Fox = y, Pontsler = y. Passed 6 yes. Motion Fox to transfer funds from the General Fund to Fund 2905 in the amount of $4115.18 – December 31,2018 balance. Second Heitkamp. Young called for the question. Fox = y, Heitkamp = y, Young = y, Gehle = y, Pontsler = y, Now = y. Passed 6 yes. Second Fox. Heitkamp called for the question. Young = y, Fox = y , Heitkamp = y, Gehle =y, Pontsler = y, Now = y. Passed 6 yes. Steve updated Council regarding the recent radio station news in the paper. Several comments not true. Attorney General’s office working on the case. Jeff not here and will discuss several items (4) tomorrow. Motion Fox to approve Joyce Emans working at the park with the same agreement as last year. The wage will be $8.55 per hour. Second Young. Pontsler called for the question. Fox = y, Young = y, Pontsler = y, Gehle = y, Now = y, Heitkamp = y. Passed 6 yes. Several items to discuss with Jeff (2) – will contact tomorrow. The RADC will be donating $3,000 toward the fireworks for the Grand Ball on December 31, 2019 that will be held to ring in the Bicentennial Year! We are looking at also having a ball drop. Meeting with Economic Development committee and Tammy Cheek scheduled for Monday – February 11th at 7 pm. We will be discussing sub division and possible spec house. Happy Anniversary to Barrys Family Market – 31 years! Thank you. Will contact Jeff regarding the water meters. Greg received a call from someone claiming to be taking donations for the Rockford Police Department – if you get a call – it’s a scam. We don’t make calls requesting donations! Steve – Shout out to Jeff – a lot of water problems on Saturday with weather conditions going from extreme cold then turning warm. Was a full day working on problems. Motion Pontsler to pay bills as submitted - 62,295.05. Second Young. Fox called for the question. Pontsler = y, Young = y, Fox = y, Gehle = y, Now = y, Heitkamp = y. Passed 6 yes. Tuesday, December 18, 2018, at 7:30 pm at the Rockford Village Hall. Motion Pontsler. Second Now to accept the agenda as orders. Heitkamp called for the question. Pontsler = y, Now = y, Heitkamp = y, Gehle = y, Young = y. Passed 5 yes. December 4, 2018 council meeting as presented. Now called for the question. Gehle = y, Young = y, Now = y, Pontsler = y, Heitkamp = y, Passed 5 yes. Best decorated house in Rockford contest will be judged on December 23rd – let’s light up the town for the Christmas season! Thank you Tom Beahrs for your service and dedication to the Village of Rockford. We congratulate you on your retirement. 10:30 am – 1 pm. The radio station will be supported by underwriting and donations even though the line items are located in the General Fund. Motion Pontsler to pay bills as submitted - $ 391,359.57. Second Heitkamp. Young called for the question. Pontsler = y , Heitkamp = y, Young = y, Gehle = y, Now = y, Passed 5 yes. Motion Pontsler to accept the Mayors Court pay in of $681.00. Second Heitkamp. Now called for the question. Pontsler = y, Heitkamp = y, Now = y, Gehle = y, Young = y. Passed 5 yes. Park project – paint interior of restrooms before opening next spring. Still looking for part time patrol officers. RADC will be handing out Christmas candy canes at the 4-way stop on December 22nd at 10 am.. We are hoping that Santa will be visiting too. Next council meeting will be held on January 15th – 2019. Tuesday, December 4, 2018, at 7:30 pm at the Rockford Village Hall. Motion Young. Second Fox to accept the agenda as orders of the day with addition of Resolution 10-18 and Resolution 11-18. Gehle called for the question. Young = y, Fox = y, Gehle = y, Pontsler = y, Now = y, Heitkamp = y. Passed 6 yes. November 20, 2018 council meeting as presented. Heitkamp called for the question. Gehle = y, Pontsler = y, Heitkamp = y, Young = y, Fox = y, Now = y. Passed 6 yes. Randy Schallenberg questioned council with regards to water bills. He currently doesn’t have water services, but is still getting charged $22.50. Jeff responded that this is how the Ordinance is set up and that every property pays the $22.50 even when there is no water services. The new ordinances that goes into effect January 1 will be changing that. Council thanked Randy for attending the meeting and voicing concerns. Christmas at the Park – successful! Thanks again to volunteers! Thank you for Shopping Small Business Saturday! Visit Santa and enjoy refreshments! WWTP project is about 50% complete with working continuing into January and finishing up projected by summer. Motion Now to pay bills as submitted - $892,547.42. Approving Shinn Brothers payment that will be made later in the month as to not hold up project. Second Fox. Young called for the question. Now = y, Fox = y, Young = y, Gehle = y, Pontsler = y, Heitkamp = y. Passed 6 yes. Motion Young. Second Pontsler. Cash Summary by Fund, Appropriations report, Revenue Report, Budget vs Actual activity report, Bank reconciliation and comparison report for the water, sewer, and income tax. Heitkamp called for the question. Young = y, Pontsler = y, Heitkamp = y, Gehle = y, Fox = y, Now = y. Passed 6 yes. Motion Young to approve supplemental appropriations to date. Second Now. Fox called for the question. Young = y, Now = y, Fox = y, Gehle = y, Pontsler = y, Heitkamp = y. Passed 6 yes. Motion Pontsler to approve additional purchase orders. Second Now. Heitkamp called for the question. Pontsler = y, Now = y, Heitkamp = y, Gehle = y, Young = y, Fox = y. Passed 6 yes. Motion Fox to approve new line items for the General Fund for the purpose of the Radio station. Second Now. Heitkamp called for the question. Fox = y, Now = y, Heitkamp = y, Gehle = y, Young = y, Pontsler = y. Passed 6 yes. Motion Pontsler to approve a Supplemental revenue and appropriation for radio station in the amount of $2526.12 for 2018. Second Heitkamp. Fox called for the question. Pontsler = y, Heitkamp = y, Fox = y, Gehle = y, Young = y, Now = y. Passed 6 yes. Motion Now to close the radio station account in the amount of $ 2526.12 to be deposited in to the Village of Rockford bank account located at Peoples Bank. Second Heitkamp. Pontsler called for the question. Now = y, Heitkamp = y, Pontsler = y, Gehle = y, Young = y, Fox = y. Passed 6 yes. A RESOLUTION RETAINING THE SERVICES OF JUDY A KOESTERS AS SOLICITOR FOR THE VILLAGE OF ROCKFORD, OHIO FOR 2019, SETTING COMPENSATION, AND ESTABLISHING RESPONSIBILITIES. Motion Fox. Second Pontsler. Heitkamp called for the question. Fox = y, Pontsler = y, Heitkamp = y, Gehle = y, Young = y, Now = y. Passed 6 yes. AN ORDINANCE TO MAKE APPROPRIATIONS FOR THE CURRENT EXPENSES AND OTHER EXPENDITURES OF THE VILLAGE OF ROCKFORD, STATE OF OHIO, DURING FISCAL YEAR ENDING DECEMBER 31,2019. Motion Now to approve Ordinance 01-18 amendment to include radio station line items for 2019. Second Heitkamp. Fox called for the question. Now = y, Heitkamp = y, Fox = y, Gehle = y, Young = y, Pontsler = y. Passed 6 yes. Greg and Jeff talking – not on same page yet. Motion Fox. Second Now. Gehle called for the question. Fox = y, Now = y, Gehle = y, Young = y, Pontsler = y, Heitkamp = y. Passed 6 yes. Some discussion on the water / sewer rates. The commercial rates are the rates that are changing the most. AN ORDINANCE OF THE VILLAGE OF ROCKFORD, OHIO FOR THE VILLAGE WATERWORKS SYSTEM, ENACTING NEW RATES PERTAINING TO THE CHARGES AND RULES FOR WATER AND WATER SERVICE PROVIDED BY THE VILLAGE OF ROCKFORD, REPEALING ANY CONFLICTING LEGISLATION, AND DECLARING AN EFFECTIVE DATE. Motion Young. Second Heitkamp. Now called for the question. Young = y, Heitkamp = y, Now = y, Gehle – y, Fox = y. Pontsler = y. Passed 6 yes. AN ODINANCE OF THE VILLAGE OF ROCKFORD, OHIO FOR THE VILLAGE WASTEWATER TREATMENT SYSTEM, ENACTING NEW RATE PERTAINING TO THE CHARGES AND RULES FOR WASTEWATER SERVICE PROVIDED BY THE VILLAGE OF ROCKFORD, REPEALING ANY CONFLICTING LEGISLATION, AND DECLARING AN EFFECTIVE DATE. Motion Gehle. Second Young. Heitkamp called for the question. Gehle = y, Young = y, Heitkamp = y, Fox = y, Pontsler = y, Now =y. Passed 6 yes. Will be changing out defective meter heads at approximately 10 per day. We are upgrading the billing software to include the option to email water bills and a web site link where residents can look up their information online. Along with new rates, we are talking with the bank to see if auto payments can be set up also. Holly Lane at the curve in front of the Community Building. Holly Lane and Front street – low area needs work. Also look at sidewalks on Holly Lane. We will keep the December 18th meeting on the calendar with a possibility of cancellation if nothing pressing. We will also be canceling the 1st meeting in January as January 1st is a holiday. The January meeting will be held on the 15th. Tuesday, November 20, 2018, at 7:30 pm at the Rockford Village Hall. Francis and Sandy Schaffner, Srgt. Stetler. Motion Pontsler. Second Gehle to accept the agenda as orders of the day. Now called for the question. Pontsler = y, Gehle = y, Now = y, Young = y. Passed 4 yes. November 6, 2018 council meeting as presented. Pontsler called for the question. Young = y, Now = y, Pontsler = y, Gehle = y. Passed 4 yes. THANKS to the Rockford voters for passing the Village of Rockford renewal of the General expense levy. (251 yes / 103 no). Jeff would like to extent an invitation to those that voted ‘no’ to call or stop by the Village office to discuss reasons for voting as such. We would appreciate your input in making improvements. If you Know Mike, Come and Celebrate with him and his family! November 30th. He cordially invites those who know him to an informal celebration of 24 years of service. Please join us on November 24th, 1~3 pm at Rockford community building. Mike requests no gifts, just come for a fun time. Refreshments provided. " that was presented to Francis and Sandy Schaffner on behalf of Mike. WWTP project going good and on schedule for now. Leaves continue to fall. Would like to be done with leaf pick up the 2nd week of December. Stop sign at alley and Market St. near the carry out. Need to install but have to order more signs. We have replaced roughly 26 signs. other locations for replacement will be 33 and Holly Lane and replace bent sign on Second St.
Motion Young to pay bills as submitted - $10,116.37. Second Pontsler. Now called for the question. Young = y, Pontsler = y, Now = y, Gehle = y. Passed 4 yes. Motion Pontsler to accept the Mayors Court pay in $1035.00. Second Young. Gehle called for the question. Pontsler = y, Young = y, Gehle = y, Now = y. Passed 4 yes. Tree committee has purchased 17 trees to be planted at the park. A very nice variety. A finance meeting was held on November 13th. Discussed the police salaries for the end of the year. Final budget for 2019. Motion Now to approve Ordinance 01-18. Second Young. Gehle called for the question. Now = y, Young = y, Gehle = y, Pontsler = y. Passed 4 yes. Motion Young to approve a Supplemental appropriation for police salaries in the amount of $3,000. Second Now. Pontsler called for the question. Young = y, Now = y, Gehle = y, Pontsler = y. Passed 4 yes. Motion Young to approve the purchase of Chamber gift certificates for Full time ($50) and Part time ($30) employees of the Village as a token of appreciation. Second Pontsler. Now called for the question. Young = y, Pontsler = y, Now = y. Gehle = y. Passed 4 yes. Getting ready for next audit. Mayor and Council may be getting emails. Please reply to them asap. Would like to meet with Jeff to see what projects still need done at the park. Gutter guards have been installed on the pavilions. Also want to begin list of projects for next year. Need to get slide replaced – top priority. Jeff reported that we had table top safety meeting here last week regarding tornado awareness and some step that can be done to prepare. Hopefully, we never have such an event. 12 people from various communities involved. This will also count as continuing education hours. Showed interest in having meetings in Rockford again. Need to attend 2 of these each year and document the training. Asked Jeff to check on storm drain at the old Angel House - seems slats have been broken. Remember to shop local this Small Business Saturday ! Review of Rules and Regulations for the Water and Sanitary Sewer systems and billing procedures for the Village of Rockford, Mercer County, Ohio. To be implemented with the following ordinances. We look to our volunteers a lot for help in the Community. At this time, Council would like to extend our appreciation to the following people for helping with the Christmas at the Park event that will be held from 6 – 8 pm this Sunday. Thank you to leader Monty Gibbons and his helpers Stephanie and Justin Miller, Tammy Cheek, Amber Hall, Brent Ireland, and Joyce Emans. 1. Police at the school – hard number of time spent there. 3. Brad would like to do a job shadow one day next week to see what the schedule is like at the school. 4. Other schools with security or resource officers. What they are doing and how are they paid ? Would like to collect the facts and then work on some solutions. It was noted that daily logs for the police department are kept with payroll records. Would like logs for other departments as well. How much time spent at the park, water plant, etc. Mayor Joseph thanked Brad for taking charge of this. Agrees we need to get information to begin working on the solutions. Thank you to the Photo Star for publishing press release regarding the Rockford American Legion and the Rockford Bicentennial committee coming together to raise funds for the Veteran’s Memorial at Hedges Park. We ask the community to read the article and consider making a donation. Tuesday, October 16, 2018, at 7:30 pm at the Rockford Village Hall. Also attending: Tom Stankard of the Daily Standard, Robby Peel, Brett Peel, Srgt. Stetler. Motion Young. Second Now to accept the agenda as orders of the day. Heitkamp called for the question. Young = y, Now = y, Heitkamp = y, Gehle = y, Pontsler = y. Passed 5 yes. October 2, 2018 council meeting as presented. Gehle called for the question. Pontsler = y, Heitkamp = , Gehle = y, Young = y, Now = y. Passed 5 yes.. Noted and reviewed Mayors Court pay in, bank reconciliation and bank statement. Thank you to Kids Kastle for the thank you letters we received. They appreciated coming to Shanes Park and enjoyed the splash pad. Wednesdays each week – Community Meal at the Rockford United Methodist Church at 5:02 pm. – after Kids Club – no school/no meal. Giveaways, Hoola Hoop Contest, Concessions include – Fried Bologna, Corn Dogs, Big Dill Pickles, Coney Dogs, Root Beer Floats and Sundaes ! • Laura Putman Photography will be at Shanes Park from 4 -5 pm before Trick or Treating taking FREE photos of your children in costume. Thanks for this public service! November 3rd – Lions Club Fish Fry – Tickets on sale now ! Motion Pontsler to pay bills as submitted - $ 6,714.24. Second Now. Heitkamp called for the question. Pontsler = y, Now = y, Heitkamp = y, Gehle = y, Young = y. Passed 5 yes. Motion Young. to accept the Mayors Court pay in - $904.00. Second Pontsler. Heitkamp called for the question. Young = y, Pontsler = y, Heitkamp = y, Gehle = y, Now = y. Passed 5 yes. Finance meeting was held on October 9th. Items discussed were 2019 budget, Police protection and possible levy on the ballot in May, full-time village wage increase of 3%. Will have another meeting on October 30th to review levy information and water / sewer rate structure. Will need to update job description for replacement maintenance person in the spring. Motion Young to Approve the 2019 Pay Schedule. Second Heitkamp. Now called for the question. Young = y, Heitkamp = y, Now = y, Gehle = y, Pontsler = y. Passed 5 yes. Read letter of intent to retire from Tom Beahrs. Motion Heitkamp to approve the retirement of Tom Beahrs on January 4th, 2019. Second Pontsler. Now called for the question. Heitkamp = y, Pontsler = y, Now = y, Gehle = y, Young = y. Passed 5 yes. There is a Community Dance October 20th featuring live music by The Bulldogs. THIS Weekend at the Community Building at Shanes park. Fremont build coming along – exciting to see the improvements. Rock Solid Performance – Charity event. Main to West Pearl St. to Franklin St.
Second Pontsler. Heitkamp called for the question. Gehle = y, Pontsler = y, Heiktamp = y, Young = y, Now = y. Passed 5 yes. Tuesday, September 18, 2018, at 7:30 pm at the Rockford Village Hall. Motion Young. Second Gehle to accept the agenda as orders of the day. Now called for the question. Young = y, Gehle = y , Now = y , Pontsler = y, Heitkamp = y. Passed 5 yes. September 4, 2018 council meeting as presented. Young called for the question. Heitkamp = y , Pontsler = y, Young = y, Gehle = y, Now = y. Passed 5 yes. Chad Miller addressed council with questions as to what is going on with the case in his neighborhood? Several issues have been filed with the municipal court. It is being handled but will take some time within the court system. Mayor noted receipt of the Mayors court pay in, bank reconciliation and bank statement. Chicken dinner – Reverse Raffle – 5 -7 pm – tickets on sale now! Nothing at this time – will answer any questions? Motion Pontsler to pay bills as submitted - $11,493.51 Second Young. Heitkamp called for the question. Pontsler = y, Young = y, Heitkamp = y, Gehle = y. Now = y. Passed 5 yes. Motion Pontsler to accepts Mayors Court pay in - $1064.30. Second Heitkamp. Now called for the question. Pontsler = y , Heitkamp = y, Now = y, Gehle = y, Young = y. Passed 5 yes. A RESOLUTION ACCEPTING THE LOCAL GOVERNMENT FUND FOR YEAR 2019: $29,273 OR $6.63%. Motion Young. Second Heitkamp. Pontsler called for the question. Young = y, Heitkamp = y, Pontsler = y, Gehle = y, Now = y. Passed 5 yes. Motion Now. Second Pontsler. Heitkamp called for the question. Now = y, Pontsler = y, Heitkamp = y. Gehle = y, Young = y. Passed 5 yes. Rockford Village tax levy will be on the November ballot – no new taxes. We are finally getting caught up with past due accounts. We have set up a budget for the year and things are looking better. We are happy with the way things are going. Very happy with the board members they are doing a great job! Motion Pontsler. Second Now to approve updated By-Laws for WRKD. Heitkamp called for the question. Pontsler = y, Now = y, Heitkamp = y, Gehle = y, Young = y. Passed 5 yes. That time of year – Budget 2019. Jeff will have some information at the next meeting. Columbia Street / Race Street – needs hot mix along with several other areas. Clean up bushes on Columbia St.
Tammy report on Subdivision – would like to see some investors build a spec house. Subdivision will take off once there is a home built. Next RADC meeting – unknown at this time. Tom Beahrs requested / proposal to Council – wanting to retire and rehire for mowing and leaf pick up. Would be rate of $6,000 – April – October. Would be a savings of $50,000. No benefits included. Contract Labor. Thank you Tom. Finance committee will discuss – Next Tuesday at 7 pm. Tuesday, August 21, 2018, at 7:30 pm at the Rockford Village Hall. Also attending: Tom Stankard of the Daily Standard, Robby Peel, Chad Miller, Srgt Stetler. Motion Now. Second Young to accept the agenda as orders of the day. Gehle called for the question. Now = y, Young = y, Gehle = y, Heitkamp = y. Passed 4 yes. August 7, 2018 council meeting as presented. Young called for the question. Gehle = y, Heitkamp = y, Young = y, Now = y. Passed 4 yes. Chad Miller expressed concerns regarding people living in a camper near his property and the conditions of another property owned by the same person on E. Pearl St. When is the Village going to take action? More discussion on the topic. Paperwork has been served. Chicken dinner – Reverse Raffle – 5 -7 pm – tickets on sale now ! Motion Young to pay bills as submitted - $165,162.67. Second Now. Heitkamp called for the question. Young = y, Now = y, Heitkamp = y, Gehle = y. Passed 4 yes. Bills included 1st pay application for the WWTP project. $83,000 was grant monies rest loan money. Motion Young. Second Gehle to accept Mayors Court pay in of $580.70. Heitkamp called for the question. Young = y, Gehle = y, Heitkamp = y, Now = y, Passed 4 yes. The next Tree Committee meeting will be held on Tuesday – August 28th at 7 pm. Fremont – moving dirt ! Their 27 million dollar expansion has begun! Now – Will we be marking the properties at the subdivision ? Gehle – Trailer Park clean up coming along. Several more trailers to be taken down yet. Tuesday, August 7, 2018, at 7:30 pm at the Rockford Village Hall. Also attending: Tom Stankard of the Daily Standard, Robby Peel, Alyssa Joseph, Megan McGeorge, Mary Beougher, Bret Peel, Lowell Beougher, Jane Now, Nancy Leighner, Marti Lentz, Yvonne Patch, Roger Patch, Jennifer Miller, Susie Miller, Ken Kilgore, Shirley Green, Bob Green, Vivian Mohler, Rita Blossom, Brenda Barker, Linda Hart, Amy Noll, Joe Noll, Gary Brehm, Barry Peel, Sr., Chad Miller, Srgt Stetler, Chief May. Motion Gehle. Second Heitkamp to accept the agenda as orders of the day with addition of those wanting to speak to council – Mary Beougher, Ken Kilgore, Brenda Barker, Yvonne Patch, Barry Peel Sr., Jennifer Miller. Pontsler called for the question. Gehle = y, Heitkamp = y , Pontsler = y, Young = y, Now = y. Passed 5 yes. July 10, 2018 council meeting as presented. Heitkamp called for the question. Young = y, Now = y, Heitkamp = y, Gehle = y, Pontsler = y. Passed 5 yes. Mary Beougher - Lived here a long time, TJ’s in business a long time without liquor permit and made it fine. We have 4 places that already sell in a 2 block area. We appreciate the stores we have and want them to remain successful. We don’t need another place to sell liquor in such a small town. Ken Kilgore of Rockford RoadDog / Duncan Oil – 12 + years. Family owned company with hands on owners purchased TJ’s 3 months ago. Want to make a lot of improvements to be able to compete in the business. Planning to add a well-known taco/burrito franchise, do renovations inside and outside. Wanting to compete with the truck-stop business where people are looking for one stop shopping. We want to be a part of the community in the future and whether this goes through or not we need community support. Brenda Barker – Same feelings as Mary. We need businesses that are already here to remain successful. Had problems with the people going around asking for signatures on a petition - Mom 90 years old was talked into signing something she didn’t even know what it was for. Evidently was for Sunday sales ? Yvonne Patch - Same feelings – didn’t appreciate the petition going around for Sunday Sales before they even knew the outcome of the meeting. Barry Peel Sr. - Yes – has a vested interest in Rockford, but what is good for the citizens of Rockford. Question to those in attendance to come up with 1 positive reason to approve permit? If approved would just cut the pie into 5 slices instead of 4. Doesn’t feel it would actually bring more revenue to the village. If they succeed and takes out one of the other 4 businesses then Rockford is losing instead of gaining. We already have enough places to purchase liquor. Ken Kilgore – feels positive of increase of business in Rockford. Would cement the corner as an established place to do business as a one stop shopping instead of going to several locations for needs for those traveling and living in the village. Jennifer Miller – works at the Eagles and has talked to a lot of people doesn’t seem to be any positives. Tom and Joyce ran a successful business for 30 years without permit. Again we already have 4 places for carry out and several sit down places that serve liquor. We don’t want a Walmart type business coming in and putting the other establishments out of business. Barry Peel Sr. – would like to ask again – can anyone come up with 1 positive for allowing the permit ? Gehle - Thank you to everyone coming and voicing your thoughts and concerns. We appreciate your interest in the community. Thank you to the Rockford Fire Department for flushing the hydrants last weekend. Waiting on report. No water problems so far ! Pontsler – Light at the park – not fixed yet. Sewer plant project – equipment for lift station ordered as this will be the 1st part of the project. Fremont has broken ground on their 27 million dollar expansion. They will be hiring an additional 70 people. This is great news ! Motion Pontsler to pay bills as submitted - $28,462.88. Second Young. Now called for the question. Pontsler = y, Young = y, Now = y, Gehle = y, Heitkamp = y. Passed 5 yes. Budget vs Actual activity report and Bank reconciliation: also the monthly transfers. Second Pontsler. Heitkamp called for the question. Young = y, Pontsler = y, Heitkamp = y, Gehle = y, Now = y. Passed 5 yes. Motion Now to approve monthly transfers, supplemental appropriations to date and approve additional purchase orders. Second Heitkamp. Pontsler called for the question. Now = y, Heitkamp = y, Pontsler = y, Gehle = y, Young = y. Passed 5 yes. Have worked on some pot holes with cold mix and will be working on more with hot mix once cooler. Excited about Fremont expansion – reminder they are hiring ! This will be a boost to Rockford. The RADC and the Bicentennial committee held a meeting together last night. Lots of plans for 2019 to prepare for year long event in 2020. The south side of the Fire Department is prepped for the mural to begin later in the year. AN ORDINANCE LEVYING ASSESSMENTS FOR DELINQUENT WATER BILLS, AND DECLARING AN EFFECTIVE DATE. Motion Gehle. Second Heitkamp. Pontsler called for the question. Gehle = y. Heitkamp = y, Pontsler = y, Young = y, Now = y. Passed 5 yes. Gehle did some research and feels that competition in business is good, however, Mercer County has already decided that we have enough liquor permits based on our population and we would be going against that quota by allowing a transfer to take place. We are maxed out on permits and shouldn’t allow one to be transferred in. Motion Pontsler to deny the TREX transfer for a liquor permit. Second Gehle. Now called for the question. Pontsler = y, Gehle = y, Now = y, Young = y, Heitkamp – abstain conflict of interest. The request has been denied. Several trees will be taken down at the park on Thursday or Friday this week. Have not received word on the final gas disconnect at the Trailer Park. Tuesday, July 10, 2018, at 7:30 pm at the Rockford Village Hall. Motion Young. Second Gehle to accept the agenda as orders of the day. Heitkamp called for the question. Young = y, Gehle = y, Heitkamp = y, Pontsler = y, Now = y. Passed 5 yes. June 19, 2018 council meeting as presented. Heitkamp called for the question. Pontsler = y, Young = y, Heitkamp = y, Gehle = y, Now = y. Passed 5 yes. Motion Pontsler to pay bills as submitted - $39,870.38. Second Heitkamp. Now called for the question. Pontsler = y, Heitkamp = y, Now = y, Gehle = y, Young = y, Passed 5 yes. Budget vs Actual activity report and Bank reconciliation: also the monthly transfers. Second Heitkamp. Now called for the question. Young = y, Heitkamp = y, Now = y, Gehle = y. Pontsler = y. Passed 5 yes. Motion Heitkamp to approve supplemental appropriations to date and approve 3rd Q blanket purchase orders. Second Pontsler. Young called for the question. Heitkamp = y. Pontsler= y . Young = y, Gehle = y. Now = y. Passed 5 yes. Tree Committee meeting – June 24th at 7 pm. Still looking for new members ! Need to look at several trees that need some attention. Park board meeting last month – reviewed a list of items that need attention at the park. Srgt Stetler working on the weeds / rubbish list. Motion Gehle to approve – part time officer Kyle Balthis. Second Pontsler. Now called for the question. Gehle = y, Pontsler = y, Now = y, Young = y, Heitkamp = y. Passed 5 yes. August 6th at 7 pm. Salt bids opening this Friday. Motion Gehle – to approve Petition from Jordan Belna to vacate all of Sugar Street as shown on the Plat of said addition – pursuant to Ohio Revised Code 723.04. Second Pontsler. Heitkamp called for the question. Gehle = y, Pontsler = y, Heitkamp = y. Young = y, Now = y. Passed 5 yes. Gas company will be shutting off the service to the trailer park. Tuesday, June 19, 2018, at 7:30 pm at the Rockford Village Hall. Robby and Barry Peel, Prosecutor Matt Fox and assistant, Martin Emerine from the Sheriff’s Office and Judy Koesters. Chris Rasbach showed up a little later. Motion Gehle. Second Now to accept the agenda as orders of the day with addition of Executive Session to discuss litigation. Pontsler called for the question. Gehle = y, Now = y , Pontsler = y, Young = y, Heitkamp = y.
June 5, 2018 council meeting as presented. Now called for the question. Gehle = y, Young = y, Now = y, Pontsler = y, Heitkamp = y. Passed 5 yes. Rob Rutledge long time community member approached council to share his views on the possible liquor permit request from Rockford RoadDog. He is against another permit in the Village. Thank you regarding Community Days – working on the Financials. Updated on the Trailer Park clean up. Motion Young to pay bills as submitted - $83,170.25. Second Now. Heitkamp called for the question. Young = y, Now = y, Heitkamp = y, Gehle =y, Pontsler = y. Passed 5 yes. Motion Pontsler. Second Young to accept the Mayors Court Pay in of $854.00. Heitkamp called for the question. Pontsler = y, Young = y, Heitkamp = y, Gehle = y, now = y. Passed 5 yes. Finance Committee meeting was held on Tuesday, June 12th at 7 pm – liability insurance, budget and water rates were discussed. The Finance Committee recommends that we stay with Stolly Insurance for coverage of our liability insurance. Motion Now to stay with Stolly Insurance. Second Heitkamp. Pontsler called for the question. Now = y, Heitkamp = y, Pontsler = y, Gehle = y. Young = y. Passed 5 yes. We will be doing a water / sewer rate restructure that will begin with the July billing. We passed Resolution 05-17 last year at this time. Some of the numbers have changed with our financing of the WWTP. Budget Hearing – was held this evening at 7:15pm. The information above was discussed. A RESOLUTION DECLARING THE VILLAGE’S INTENT TO PROCEED TO PLACE ON THE NOVEMBER 2018 GENERAL ELECTION BALLOT A 2.8 MILL RENEWAL LEVY FOR GENERAL FUND EXPENSES FOR THE VILLAGE OF ROCKFORD. Motion: Young. Second Pontsler. Now called for the question. Young = y, Pontsler = y , Now = y, Gehle = y, Heitkamp = y. Passed 5 yes. Fremont Company had presence at Community Days – working on getting hiring event to the public. The next RADC meeting – June 25th at 7 pm. Will be sending out information for salt bids – open bid date will be July 13th at 1 pm. Grass clippings in the streets and tall weeds – list to Stet. Motion Gehle. Second Young to go into “Executive Session” to discuss litigation at 7:51pm. Chris Rasbach invited to attend the session. Pontsler called for the question. Gehle = y, Young = y, Pontsler = y, Now = y, Heitkamp = y. Passed 5 yes. Motion Young to come out of Executive Session at 8:22. Second Gehle. Pontsler called for the question. Young = y, Gehle = y, Pontsler =y, Now =y, Heitkamp = y. Passed 5 yes. Tuesday, June 5, 2018, at 7:30 pm at the Rockford Village Hall. Robby and Barry Peel, Kathryn and Ryan McDaniel, and Nick – operations manager of Rockford Duncan Oil. Motion Gehle. Second Young to accept the agenda as orders of the day. Pontsler called for the question. Gehle = y, Young = yes, Pontsler = y, Fox = y, Now = y, Heitkamp = y. Passed 6 yes. May 15, 2018 council meeting as presented. Gehle called for the question. Fox = yes, Heitkamp = y, Gehle = y, Young = y, Pontsler = y, Now = y. Passed 6 yes. Ryan and Kathryn McDaniel introduced themselves and their operation manager Nick. They are the new owners of TJ’s. They shared some of their vision and some changes that may be coming. They will be called Rockford RoadDog and will be getting the signage installed soon. Council thanked them for coming to introduce themselves. 24th Annual Car Show – June 15th – West Market St.
Saturday events - Fox Family Ride, Lake Area Arts Group – Featuring Todd Buschur, Quarter auction, Parkway Choir – mini musical, George Moore, parade, THE GREAT ESCAPE ROOM, and The Muddsocks. Full schedule of events and details can be found on the Rockford Community Days – Facebook page. Working with Tammy Cheek on some marketing ideas for the Subdivision as we are about ready to begin selling lots. Dynegy will be the electric supplier for the aggregation beginning in August. Residents will receive a letter – do nothing and you will be enrolled. Additional information to go out via Facebook and press release. Wastewater treatment plant – final funding has been approved. A pre -construction meeting will take place on Monday at 10 am. Shinn Brothers was awarded the contract for 2.1 million. Rate structures will be changing. Residents will see little or no change. We are changing from lagoon to a mechanical plant – the 1st in Ohio. Took longer time for EPA to approve. Pontsler asked that some of the street signs and stop signs get replaced. We are continuing to work on the water meter issues. Motion Young to pay bills as submitted - $23,560.10. Second Pontsler. Gehle called for the question. Young = y, Pontsler = y, Gehle = y, Fox = y, Now = y, Heitkamp = y. Passed 6 yes. Budget vs Actual activity report and Bank reconciliation. Second Heitkamp. Fox called for the question. Now = y, Heitkamp = y, Fox = y, Gehle = y, Young = y, Pontsler = y. Passed 6 yes. Motion Young to approve monthly transfers, supplemental appropriations to date, and purchase orders. Second Pontsler. Now called for the question. Young = y, Pontsler = y, Now = y, Gehle = y, Fox = y, Heitkamp = y. Passed 6 yes. Finance Committee meeting – budget and liability insurance to be held on Tuesday – June 12th at 7 pm. Renewal Levy - will scan and email to review for next meeting. Park looking very nice. We have made some improvements with more to come ! Joyce doing a good job keep flowers beautiful. Motion Young. Second Gehle to approve the Tri County Alcohol annual agreement for transportation of behaviorally impaired citizens. Fox called for the question. Young = y, Gehle = y, Fox = y, Pontsler = y, Now = y, Heitkamp = y. Passed 6 yes. Reminder – pot holes need repaired. The next RADC meeting – June 25th at 7 pm. Trailer park – 3 units cleaned up. 6 more units to be done this week and over the weekend. Will continue until finished. Need to keep up on tall grass notices. Chief May requests permission to close streets for the Annual car show on Friday – June 15th and the parade on Saturday – June 16th. Motion Gehle. Second Fox. Young called for the question. Gehle = y, Fox = y, Young = y, Pontsler = y, Now = y, Heitkamp = y. Passed 6 yes. Chief May requests “Executive Session” to discuss personnel. Motion Gehle to enter Executive Session at 7:49. Second Fox. Pontsler called for the question. Gehle = y, Fox = y, Pontsler = y, Young = y, Now = y, Heitkamp = y. Passed 6 yes. Motion Gehle to come out of Executive Session at 8:02. Second Pontsler. Fox called for the question. Gehle = y, Pontsler = y, Fox = y, Young = y, Now = y, Heitkamp = y. Passed 6 yes with no action taken. Tuesday, May 15, 2018, at 7:30 pm at the Rockford Village Hall. Robby Peel, and Nancy Leighner. Motion Gehle. Second Young to accept the agenda as orders of the day with addition of Resolution 04-18. Fox called for the question. Gehle = y, Young = yes, Fox = y, Pontsler = y, Now = y, Heitkamp = y. Passed 6 yes. May 1, 2018 council meeting as presented. Heitkamp called for the question. Now = y, Pontsler = y, Heitkamp = y, Gehle = y, Young = y, Fox = y. Passed 6 yes. Nancy thanked Steve and his son for the sand blasting the wall at the end of Market St. Mrs. Carpenter and her students at Parkway will be starting a mural to be completed by the bicentennial year. Village will be pouring a color concrete stamped pad that will look like weather plank wood in front of the mural yet this week or early next week. The project will all come together and be a very nice addition to the area. Thank you to Tom for the article in the Daily Standard was very good ! Tree Committee meeting – Monday – May 21st at 6 pm… if interested in joining the committee – please come to this meeting at the Village Hall. Rockford Memorial Day Services - Monday - May 28th. Chicken dinner tickets $7 each. Prepared by the Rockford Carry Out. Pre sale tickets can be purchased at: Rockford Carry Out, Barrys' Family Market or the Rockford American Legion Post 508. Chicken dinners will be ready for pick up on the 28th at 11:30 am. Remember and Honor our Veterans! .Again thanks to Steve and his son for the help with the Market St. wall. Electric is being installed at the subdivision and should be completed this week. We will need to do finish grade work once completed. WWTP project – we will not be doing any work until the final funding comes through – hope by end of the month. Stet took list of street lights that need attention and we have notified DP & L.
Motion Pontsler to pay bills as submitted - $22,455.86. Second Young. Heitkamp called for the question. Pontsler = y, Young = y, Heitkamp = , Gehle = y, Fox = y, Now = y. Passed 6 yes. Motion Pontsler to accept the Mayors Court pay in $824.00. Second Fox. Young called for the question. Pontsler = y, Fox = y, Young = y, Gehle = y, Now =y, Heitkamp = y. Passed 6 yes. A RESOLUTION OF NECESSITY TO PLACE ON THE NOVEMBER 2018 GENERAL ELECTION BALLOT A 2.8 MIL RENEWAL LEVY FOR GENERAL FUND EXPENSES FOR THE VILLAGE OF ROCKFORD, OHIO. Motion Fox. Second Heitkamp. Now called for the question. Fox = y, Heitkamp = y, Now = y, Gehle = y, Young = y, Pontsler = y. Passed 2 yes. Preliminary budget to the auditors office by July 20th. Will be using same information. Nothing new at this time. Shanes Park will be busy this weekend as we have several tournaments going on. Could be as many as 18 teams. Make sure trash is picked up Mondays and Thursdays during the summer months when park is very busy. Street signs and faded stop signs need replaced. Also some trees need to be trimmed – blocking signage. Need to contact Ron Amstutz about his rental. Tree needs to come down. The RADC will not have a meeting this month because of Memorial Day. Next meeting will be on June 25th. Trailer park – we have contracted with Mahargs for clean up. The loose trash has been cleaned up. Gas has been shut off and waiting on electric. Dayton news channel 45 was here today interviewing Chief May about field testing of a new product. Watch news at 10. Tuesday, May 1, 2018, at 7:30 pm at the Rockford Village Hall. Robby Peel, Nancy Leighner, and Mike Maharg. Motion Now. Second Young to accept the agenda as orders of the day. Pontsler called for the question. Now = y, Young = y , Pontsler = y, Gehle = y. Passed 4 yes. April 17, 2018 council meeting as presented. Now called for the question. Young = y, Pontsler = y, Now = y, Gehle = y. Passed 4 yes. Discussion on the Verizon small cell towers. Motion Pontsler to pay bills as submitted - $9023.07. Second Now. Young called for the question. Pontsler = y, Now = y, Young = y, Gehle = y. Passed 4 yes. Budget vs Actual activity report and Bank reconciliation: Second Now. Pontsler called for the question. Young = y, Now = y, Pontsler = y, Gehle = y. Passed 4 yes. Motion Now to approve monthly transfers, supplemental appropriations to date and Purchase orders. Second Pontsler. Young called for the question. Now = y, Pontsler = y, Young = y, Gehle = y. Passed 4 yes. Renewal Levy - review updated information from the Board of Elections. Council approved moving forward towards November ballot. 2019 – Budget to auditor’s office by July 20th. The RADC meeting guest speaker was Andrew Peel owner of Rock Solid Performance. Discussed some of the details – goals, key fob system, personal trainer access, fitness classes, $30 per month. Motion Pontsler to agree to terms of deal for Jeff to have papers and designated signatory official for the clean up of the trailer park. Second Now. Young called for the question. Pontsler = y, Now = y, Young = y, Gehle = y. Passed 4 yes. Pontsler – brought up issues regarding parking, sidewalks, and trees. Tuesday, April 17, 2018, at 7:30 pm at the Rockford Village Hall. Robby Peel, Chad Ransbottom – little later. Motion Pontsler. Second Gehle to accept the agenda as orders of the day. Heitkamp called for the question. Pontsler = y, Gehle = y, Heitkamp = y , Young = y, Now = y. Passed 5 yes. April 3, 2018 council meeting as presented. Now called for the question. Young = y, Gehle = y, Now = y, Pontsler = y, Heitkamp = y. Passed 5 yes. The Parkway Arbor Day presentation was held on April 10th. Something for everyone – come out and support a good cause! We re-fabed a piece of equipment to drag the alleyways. We should be able to do the work faster and more often. Pot Hole issues still need addressed once the weather is nice enough for asphalt. Street sweeper has been fixed and back in operation. Trailer park clean up - have been made an offer to clean up for land swap. Current estimate to clean up is $30,000 in disposal fees. Need to post no trespassing signs as people are trying to steal whatever they can get their hands on for scrap. The Finance committee will review information on April 24th at 7 pm. We will be working with Fremont as they continue to expand. We are looking at putting in a new entrance 33 east to keep semis out of the residential area. We are looking at a grant of $650,000 for this project. They are planning job creations of 60+ jobs. They have signage that they are now taking applications. Once the entrance is done we will post – No Truck signs. The current entrance would only be used by employees. $13,666.18. Now called for the question. Pontsler = y, Young = y, Now = y, Gehle = y, Heitkamp = y. Passed 5 yes. Motion Young to accept the Mayors Court pay in of $498. Second Pontsler. Heitkamp called for the question. Young = y, Pontsler = y, Heitkamp = y, Gehle = y, Now = y. Passed 5 yes. Inspected tree at Dooley property. Doesn’t look to be urgent. Will try to contact him to see what his plans are. Service Committee: Greg Pontsler – nothing at this time. Safety Committee: Chris Heitkamp - nothing at this time. Jeff mentioned that he received a call from small cell tower service. Will contact and get more information. Renewal for liquor permits – all ok at this time. Mayor would like to review the junk / weeds spreadsheet. Have given out at least 12 notices. Several properties that need some action soon. Will contact the new Mercer County Judge to verify court proceedings in case we have to do some referrals in that direction. Radio Station – going good. Steve is getting the quarterly updates. We have a 2 signature checking system. Everything is being posted to quick books. We have several accounts that we are working to get caught up. Good music changes. Encourage the public to give it a try! Station working on Parkway spring sports broadcasts. We are moving in the right direction and will be making more improvements once we get additional underwriters. The Board continues to meet once a month. Please let Brad Now know the next meeting date and time. Street light issues – working on them. Tuesday, March 6, 2018, at 7:30 pm at the Rockford Village Hall. Also attending: Tom Stankard of the Daily Standard, and Srgt Stetler. Motion Gehle. Second Fox to accept the agenda as orders of the day. Pontsler called for the question. Gehle = y, Fox = y, Pontsler = y, Young = y, Now = y, Heitkamp = y. Passed 6 yes. February 6, 2018 council meeting as presented. Now called for the question. Heitkamp = y, Young = y, Now = y, Gehle = y, Fox = y, Pontsler = y. Passed 6 yes. Received letter from Joyce Emans regarding some part time hours at the park to take care of the flowers. No one else has stepped up to take over. Would be for no more than 10 hours a week anything over the 10 hours is a donation to the Village. Would be paid at $8.30 per hour. Motion Gehle. Second Young. Fox called for the question to approve April through September taking care of the flowers. Gehle = y, Young = y, Fox = y, Pontsler = y, Now = y , Heitkamp = y. Passed 6 yes. ** donations being accepted now. · Please give information to the Radio Station so they can help us promote these events. We will be advertising for bids for the WWTP project this week and next week. We will open bids March 28th at 2 pm. Should have 6 – 10 bidders easy. We have a 1 year completion for improvements. Will be meeting with Fremont on March 12 to discuss their needs regarding utilities and storm water issues. This week we are beginning to reroute the electric from the Old Shane Hall building at a cost of approximately $4,000. We are increasing to a bigger service line. Once that is completed the old building will be coming down. We plan to make the area some green space. Thank you to Rob Belna as he will be taking the block and for the use of his equipment. We will be getting rid of the wooden structure and roof. It worked out good that the fire department used the building for several training exercises. Some discussion on street lights and handicap parking on Main Street. $14,665.19. Heitkamp called for the question. Pontsler = y, Now = y, Heitkamp = y, Gehle = y, Young = y, Fox = y. Passed 6 yes. Budget vs Actual activity report and Bank reconciliation. Second Young, Heitkamp called for the question. Fox = y, Young = y , Heitkamp = y, Gehle = y, Pontsler = y, Now = y . Passed 6 yes. Motion Fox to approve monthly transfers. Second Heitkamp. Young called for the question. Fox = y, Heitkamp = y, Young = y, Gehle = y, Pontsler = y, Now = y. Passed 6 yes. Motion Young to approve supplemental appropriations. Second Pontsler. Heitkamp called for the question. Young = y, Pontsler = y, Heitkamp = y, Gehle = y, Fox = y, Now = y. Passed 6 yes. Motion Young to approve additional purchase orders. Second Heitkamp. Fox called for the question. Young = y Heitkamp = y, Fox = y, Gehle = y, Pontsler = y, Now = y. Passed 6 yes. Motion: Pontsler. Second Heitkamp. Young called for the question. Pontsler – y, Heitkamp = y, Young = y, Gehle = y, Fox = y, Now = y. Passed 6 yes. Current Levy for Expenses will be expiring. Discussion on renewal vs replacement. Need several resolutions and approval by the end of July for the November ballot. Resolution for approval will need to go to the county auditor for their review and approval. Then will need a resolution to approve the ballot language. Council agreed to renewal – no new taxes. There will be a resolution for approval at the next meeting. 1. Page 1 of your Federal 1040 MUST be attached along with all W-2’s and 1099’s. RETURNS WILL NOT BE PROCESSED UNTIL 1040 IS RECEIVED. This could result in late fees - see #5. 3. All individual and business returns are due by April 15th. Business returns with a F/Y ending date are due the 15th of the fourth month following the year end date. Extensions must be filed by April 15th. 4. ALL RETURNS MUST BE SIGNED. 5. A $25.00 per month late fee, up to 6 months or $150 will be added to any late filed returns – even if no tax is due. 6. Late returns with balances due will be charged 15% penalty plus interest until balance is paid in full. We will need to amend our Tax Ordinance as the State is making it a requirement that we comply with Centralized Collection of municipal net profit taxes be paid via the Ohio Business Gateway. Lisa to get Judy a sample ordinance for review. Does not make financial sense for the smaller villages. Park board will be purchasing some additional equipment for the park. 2 swing sets and 3 other items. We will be holding a safety meeting on March 20th at 7 pm. Jeff gave out some information to review regarding some Covenants and Restrictions for the Subdivision. This will be discussed on Wednesday March 14th at 7 pm. Suggestions will be brought to the next council meeting. Barn Quilt Class will be held on March 31st at the Rockford United Methodist Church. Limited seats – cost $15.00. Pearl St and Main street issues. Employee Handbook - 2.7 Attendance and Tardiness – discussion of handbook policies. Mayor stated that request for time off be reported – paperwork, email or texting. Several council members have not reviewed the handbook and will be sending email with information. Please review for any updates that need to be handled. Motion Gehle. Second Young. Designate Lisa Kuhn as representative for Mayor and Council for the Public Records training – March 21st. She will also be attending continuing education on March 22 and 23. Heitkamp called for the question. Gehle = y, Young = y, Heitkamp = y, Fox = y, Pontsler = y, Now = y. Passed 6 yes. Tuesday, February 6, 2018, at 7:30 pm at the Rockford Village Hall. Also attending: Chief May, Tom Stankard of the Daily Standard, and Srgt Stetler. Motion Pontsler. Second Gehle to accept the agenda as orders of the day. Now called for the question. Pontsler = y, Gehle = y, Now = y, Young = y, Heitkamp = y. Passed 5 yes. January 16, 2018 council meeting as presented. Heitkamp called for the question. Gehle = y, Young = y, Heitkamp = y, Pontsler = y, Now = y. Passed 5 yes. Presidents Day – February 19th – Village offices will be closed. Wastewater Treatment Plant – Rehab project will enable 400% industry growth and 25-40% residential. Hoping we can do without raising rates. Eliminate 1/1 in our wastewater collection system. This should keep us good for the next 30 years. Blair and Bubba will be gaining more responsibility with WWTP and WTP – will be retiring in 1 – 2 years. Remove and replace existing electric meter service currently to old Shane Hall building. Use Time Warner building for storage. Clean up trailer park of old buildings and trailers. Turn into green space for park as we plan for future use. Program to replace current street lights to LED lighting. Review and address empty lots and buildings. Goal to reduce by half. Review various organizations and boards from which the community benefits by reviewing their goals for the future. This way several organizations may want to work together. Energize the various organizations and board and develop creative way of capitalizing opportunities they represent. Provide the conceptual framework and educational assistance that enables our community to do it’s own economic development. Develop plan to use the WRKD radio station in communicating with residents. $48,701.93. Now called for the question. Young = y, Heitkamp = y, Now = y, Gehle = y, Pontsler = y. Passed 5 yes. Budget vs Actual activity report and Bank reconciliation. Second Heitkamp. Young called for the question. Pontsler = y, Heitkamp = y, Young= y, Gehle = y, Now = y, Passed 5 yes. Motion Heitkamp to approve monthly transfers. Second Now. Pontsler called for the question. Heitkamp = y, Now = y, Pontsler = y, Gehle = y, Young = y. Passed 5 yes. Motion Now to approve supplemental appropriations. Second Heitkamp. Young called for the question. Now = y, Heitkamp = y, Young = y, Gehle = y, Pontsler = y. Passed 5 yes. WRKD update – The Board has been put in place and is working together to move forward. Letters will be going out to past underwriters to let them know of changes and see if they would be interested in underwriting again. The music has been changed to adult contemporary with some Christian contemporary in the mix. We will be working on the programming and playlists. One request was to bring back the Blue Show. Brad Now may be interested in putting together a Jazz Show. Will be adding more of the Public Service announcements. Will be working with students to get them involved. Right now everything is on a volunteer basis. Looking down the road – once the bills are caught up and we are running smoothly we may look at creating some scholarship opportunities. With that we need to approve the WRKD bylaws to give them a starting point. Motion Pontsler. Second Gehle. Now called for the question. Pontsler = y, Gehle = y, Now = y, Young = y, Heitkamp = y. Passed 5 yes. Rec Board goals – Finish Diamond 5 will be used for t-ball and coach pitch. Stone around outfield diamonds and electric to the new building. Jeff to talk with Rec Board to help with that plan. Snow removal - request maybe start a little earlier in the mornings. We did get more snow than was predicted. Attending the RADC meetings- request to review the Shanes Crossing restrictions and covenants – review the square footage. Jeff to do some research for the next meeting. Would like to see the new Chamber directories out in local businesses. Yes – have that on the plan. The end of March will be a barn quilt painting class. This is a fundraiser for the Bicentennial. Working on a barn quilt map from Spencerville to Berne. Location the Village Hall – 151 E Columbia St. The public is invited to bring questions to the meetings. Chief May is having problems finding part time patrol officers to work for $11 an hour. He is asking council to raise the pay of the part time police position to $15 per hour. Motion Gehle. Second Young to increase the hourly pay to $15. Heitkamp called for the question. Gehle = y, Young = y, Heitkamp = y, Now = y, Pontsler = y . Passed 5 yes. Motion Gehle. Second Heitkamp to rehire former part time officers Stose and Clevenger. Now called for the question. Gehle = y, Heitkamp = y, Now = y, Young = y, Pontsler = y. Passed 5 yes. Tuesday, January 16, 2018, at 7:30 pm at the Rockford Village Hall. Motion Pontsler. Second Fox to accept the agenda as orders of the day. Gehle called for the question. Pontsler = y, Fox = y, Gehle = y , Young = y, Now = y, Heitkamp = y. Passed 6 yes. January 2, 2018 council meeting as presented. Now called for the question. Gehle = y, Young = y, Now = y, Fox = y, Pontsler = y, Heitkamp = y. Passed 6 yes. Noted receipt and review of Mayors Court pay in, bank reconciliation and the bank statement. RADC Committee Meeting – January 22 – 7 pm – Library basement. Ohio checkbook - Council ok to go live. Budget vs Actual activity report and Bank reconciliation. Second Heitkamp. Gehle called for the question. Pontsler = y, Heitkamp = y, Gehle = y, Young = y, Fox = y, Now = y. Passed 6 yes. Motion Fox to approve monthly transfers. Second Young. Gehle called for the question. Fox = y, Young = y, Gehle = y, Pontsler = y, Now = y, Heitkamp = y. Passed 6 yes. Motion Now to approve supplemental appropriations to date. Second Pontsler. Fox called for the question. Now = y, Pontsler = y, Fox = y, Gehle =y, Young = y. Heitkamp = y. Passed 6 yes. Motion Fox to approve the 2018 purchase orders and 1st quarter blanket certificates. Second Heitkamp. Young called for the question. Fox = y, Heitkamp = y, Young = y, Gehle = y, Pontsler = y, Now = y. Passed 6 yes. Motion Fox to accept the Mayors Court pay in of $714.00. Second Pontsler. Gehle called for the question. Fox = y, Pontsler = y, Gehle = y, Young = y, Now = y, Heitkamp = y. Passed 6 yes. Motion Pontsler to pay bills submitted in the amount of $52,665.77. Second Young. Fox called for the question. Pontsler = y, Young = y, Fox = y, Gehle = y, Now = y, Heitkamp = y. Passed 6 yes. Park goals for 2018 – 2 people interested in helping decorate the park for Christmas next year. Looking at purchasing 2 – 3 more play equipment for younger children. The digital sign for the Community Building should be here soon. Need the 2018 Rec Board Members for council approval. Mayor side note – hasn’t received anyone’s goals for 2018. Please have them to her by the next meeting. Will start attending the RADC meetings to give council update on what they are doing. When weather breaks need to grade out allys and fix pot holes. There is also a sink hole that needs attention. Village information card to be updated. Still waiting on the Pearl St real estate sale paperwork to be done. Motion Fox. Second Pontsler to go into Executive Session at 7:47 regarding security and personnel. Heitkamp called for the question. Fox = y, Pontsler = y, Heitkamp = y, Gehle = y, Young = y, Now = y. Passed 6 yes. Motion Fox. Second Gehle to come out of Executive Session at 8:24. Pontsler called for the question. Fox = y, Gehle = y, Pontsler = y, Young = y, Now = y, Heitkamp = y. Passed 6 yes. Action taken – Council approved a Security Audit. Action Taken – Motion Gehle. Second Ponstler because of management issues Jim Crocker and Crocker Media Group LLC will be dismissed as general manager of WRKD radio station. Now called for the question. Gehle =y, Pontsler = y, Now = y, Young = y, Fox = y, Heitkamp = y. Passed 6 yes. Motion Fox. Second Young that Jim Crocker is not allowed on Village property without an appointment and supervision. Gehle called for the question. Fox = y, Young = y, Gehle = y , Pontsler = y, Now = y, Heitkamp = y. Passed 6 yes. Motion Fox. Second Gehle for Jim Crocker to return license plates with WRKD radio to Village personnel. Heitkmap called for the question. Fox = y, Gehle = y, Heitkamp – y, Young = y, Pontsler = y , Now = y. Passed 6 yes. Tuesday, January 2, 2018, at 7:30 pm at the Rockford Village Hall. Thank you for being willing to serve the community. Also attending: Chief May, Tom Stankard of the Daily Standard, and Judy Koesters. Motion Gehle. Second Heitkamp to accept the agenda as orders of the day. Now called for the question. Gehle = y, Heitkamp = y, Now = y, Young = y. Passed 4 yes. December 19, 2017 council meeting as presented. Heitkamp called for the question. Gehle = y, Now = y, Heitkamp = y, Heitkamp = y. Passed 4 yes. Open nominations for Council President. Heitkamp nominated Gehle with Now making a second motion. No other nominations were presented. Motion Young, Second Gehle. Heitkamp called for the question. Young = y, Gehle = ab, Heitkamp = y, Now = y. Passed 3 yes. Congratulations Steve – 2018 Council President. Thank you letter from Mark Wulfhorst. 2018 Council committees will remain the same with Shane Young replacing Rob Rutledge. It’s very cold outside ! Plowing snow question – normally we plow when we get more than 2” of snow with no winds. Rockford information on the Ohio checkbook has been updated. Will be getting council log on and password information to review before going live. A RESOLUTION CREATING AND ACCEPTING THE VILLAGE OF ROCKFORD NATURAL GAS AGGREGATION PROGRAM PLAN OF OPERATION AND GOVERNANCE. MOTION: Gehle. Second Heitkamp. Now called for the question. Gehle = y, Heitkamp = y, Now = y, Young = y. Passed 4 yes. A RESOLUTION CREATING AND ACCEPTING THE VILLAGE OF ROCKFORD ELECTRIC AGGREGATION PROGRAM PLAN OF OPERATION AND GOVERNANCE. MOTION: Now. Second Heitkamp. Young called for the question. Now = y, Heitkamp = y, Young = y, Gehle = y. Passed 4 yes. Rockford Radio Station WRKD – License holder Village of Rockford. Motion: Gehle. Second Heitkamp - Village of Rockford requires the following steps be taken by January 9th at 7 pm. Now called for the question. Gehle = y, Heitkamp = y, Now = y, Young = y. Passed 4 yes. • New Account dba – WRKD – be closed and funds returned to the Village of Rockford / WRKD account. • Bank Statements from account dba WRKD - October, November and December by January 9th meeting and January statement by February 10th. All statements turned into the Village of Rockford Fiscal Officer – to determine the total of funds to be returned to the Village of Rockford / WRKD account. • Verification from bank that the dba WRKD has been closed. • Jim Crocker to be removed from the Village of Rockford/WRKD account as a signatory. Any reference to Crocker Media Communications address needs to be changed to personal address. PO Box at the Post Office should not be referencing WRKD. Need to disclose any references to other accounts that may contain WRKD and or dba WRKD. Motion Gehle. Second Heitkamp. Young called for the question. Gehle = y, Heitkamp = y, Young = y. Now = y. Passed 4 yes. Radio station Board members and council members to have a meeting on January 9th at 7 pm. Meeting will begin by verifying financial steps listed above have been done. . Review and finalize the by-laws. By motion at the next Council meeting to be held on January 16th – need to have WRKD By-Laws approved. DID YOU KNOW~~~ YOU CAN PURCHASE LARGE ITEM TRASH TICKETS AT THE VILLAGE OFFICE? MOST TICKET ITEMS ARE $5.00. THE TICKET IS THEN PUT ON THE LARGE TRASH ITEM AND PUT OUT WITH YOUR TRASH ON THURSDAYS. IT’S A GREAT WAY TO CLEAN UP AT AN AFFORDABLE PRICE. ! year. Cake and punch was served after the meeting. 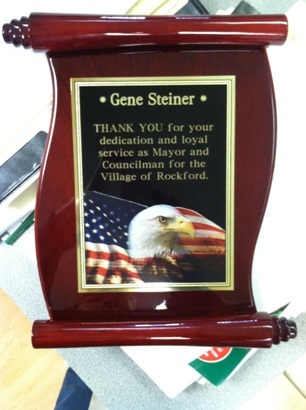 Thanks again to Gene Steiner for helping to make Rockford a better place. Left: Gene Steiner and his wife Mary. Above: Awarded plaque thanks Gene for being the Mayor of Rockford as well as Councilman over the past 40 years. Rockford Village Council called to order by Mayor Amy Joseph on Tuesday, May 19, 2015 at 7:30 pm at the Rockford Village Hall. Northwest Ohio awards ceremony at West Unity, Ohio. life through a comprehensive street tree management program. standards: An established tree ordinance, an active tree commission, a comprehensive urban forestry program supported by a minimum of $2 per capita and an annual Arbor Day proclamation and public service observance. if interested at 419-363-3032 ext 1. Thanks for Nikki Fox of Fox Photography for sharing this picture. The old Rockford Locker building and former offices of Dr. Bradrick (in the 70's) and Dr. Santanello in the 80's in the brick apartment complex on Main Street in Rockford are being torn down to make way for future expansion of the Rockford Fire Department and other Village ventures. Click on smaller thumbnail pictures to enlarge them. Thank you to Bob Maurer for taking these early morning pictures this week of the demolition work on Rockford's Main Street buildings next to the fire station. The buildings were abandoned and approved for razing. No plans for the empty lots as of yet. The Rockford Tree Commission was recognized and presented the National title of Tree City USA at the annual banquet for 23 years of tending to and replacing trees in Rockford. The banquet was held on May 9 in Rockford and represented Tree City recipients from Northwest Ohio. Other communities co-hosting the event with Rockford were the villages of Rockford, Coldwater and Ft. Recovery as well as their tree commissions. The Ohio Department of Natural Resources, Division of Forestry, were the presenters and they honored the communities for their ongoing efforts to maintain and improve the quality of life in their respective communities through a comprehensive street tree management program. These three communities were recommended by the Urban Forester to the Arbor Day Foundation for their awards based on meeting four standards: a tree ordinance; an active tree commission; a forestry program supported by $2 per capita; and an annual Arbor Day Proclamation and activity. The State of Ohio has more Tree City USA than any other state with 249 this year.52 are from the Northwest and all of them were honored in Rockford at the Community Building ceremony. Shown above are Rockford Tree Commission Members: Ed Long, Tim Williams, Tom Ransbottom, Bob Bollenbacher; Steve Gehle and Karen Long. The Villages of Coldwater, Fort Recovery, and Rockford will host the Northwest Ohio "Tree City" awards program at the Community Building in Rockford on May 9, 2012. The Village of Rockford has been a Tree City for the past 23 years. The "Tree City USA" awards are presented by the Ohio Department of Natural Resources, Division of Forestry, to communities for ongoing efforts to maintain and improve the quality of life through a comprehensive street tree management program. The state of Ohio currently boasts the greatest number of Tree Cities in the country with a grand total this past year of 249. 52 of Northwest Ohio's communities are Tree Cities and are being recognized for their achievements at the Mercer County's awards ceremony. Pictured: Red Horse Chestnut tree on Main Street of Rockford. Patrolmen in Rockford are using a new mode of transportation this summer (2010). The Rockford Village council bought a new $5,100 golf cart for the Police Department. It is gasoline powered, and is so far using a lot less gasoline than the cruisers. Chief Paul May uses it just like the cruiser or their bicycles when it comes to investigating complaints and ticketing motorists. Paul used it last weekend to help with the 5K run. It can get in a lot tighter spots than the original mode of operation. Rockford Police Remind Parents to Talk with Their Children About Playing Outside. Do not cross the street alone if younger than age 10. Never play in the road. Always try to walk on paths or sidewalks. If there are no sidewalks or paths, walk facing road traffic. Look both ways for danger before and while crossing the street. Walk, do not run, into the street. Dress in bright colors or wear retroreflective materials so drivers can easily see you. Wear a bicycle or motorcycle helmet on every ride. Check to see if your helmet should have a safety certification. Ride so drivers and cyclists can see you. Look both ways for oncoming vehicles before turning or crossing a street. Go only when it is clear. Watch out for potholes, cracks, rocks, wet leaves, storm grates, railroad tracks or anything that could make you lose control of your bike. Make sure your bike fits your height, weight and age. The Holiday Season is fast approaching and the Rockford Police would like to remind citizens of the dangers of leaving children unattended in Motor Vehicles. The Centers for Disease Control and Prevention reports that from July 1, 2000 through June of 2001 an estimated 9,160 children (14 and younger) where treated in hospitals from injuries caused by being left in unattended vehicles. 1. Plan ahead to use drive-through services where available such as pharmacies and banks. 2. Use your debit card or credit card at gas pumps. 3. Have the grocery clerk load your bags and return the cart. 4. Keep vehicles locked at all times- even at home in the garage. 6. Ensure that your garage doors have sensors that will not allow the door to come down if "beam is broken". "Most police agencies offer emergency "Unlock of Vehicle" if a child is locked inside. A simple chore of running in for milk could result in an unintended injury to your most precious cargo. Remember NO ONE would leave a million dollars in their vehicle or leave their child play with a loaded gun, so NEVER LEAVE YOUR CHILD INSIDE an unattended motor vehicle. For more information please visit www.kidsincars.org " says Paul P. May III, Chief of Police, Village of Rockford.